Watch this tennis star shine! 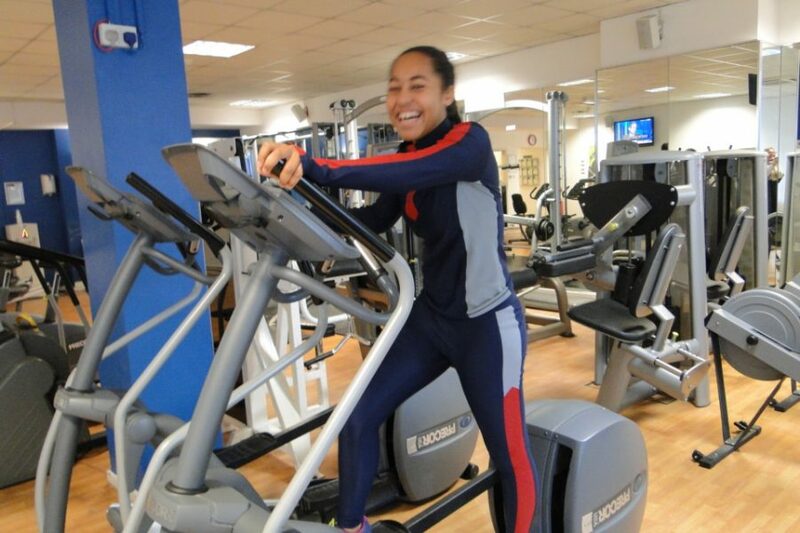 International tennis player Erika Campbell has joined our gym at YMCA Wimbledon to keep fit as part of her training program. We are thrilled to welcome this aspiring young player (she is just 15 years old). Erika is a Wimbledon local (having previously lived in Switzerland) and has been playing tennis since she was five years old, and competing in tournaments since she was seven in Europe and America. “I’ve always loved the sport, I love the competitive side of it – hitting the ball makes me happy!” says Erika. She is privately coached with a tailored programme to help her develop, and trains at the Annabel Croft Tennis Academy based at the National Tennis Centre in Roehampton and Westside Tennis Club. Her father Terry helps her with fitness and match preparation, the selection of tournaments to compete in and goes online most days to see what’s on, what other players’ rankings are and the deadlines for applications and so on. “ I try to compete at least a month – if it’s a national tournament I need to train and prepare,” explains Erika. Her fitness programmes change depending on the skill set she will need for each tournament and these are planned with her strength and conditioning coach every four months or so: “Sometimes for matches, Erika will need specific exercises to build up speed and agility,” says Terry Campbell, Erika’s father. ” I change it according to how I’m competing,” says Erika. “I have to have a strategy to compete against much bigger and experienced girls than me”. So why did Erika choose the gym at YMCA Wimbledon? “I came here as other gyms in the area wouldn’t accept under 16s. Plus it’s quiet which is good. Other gyms have been rowdy, but here I can really concentrate,” explains Erika. “ At YMCA Wimbledon gym they have everything and I think it’s very good. Other gyms don’t tend to cater for people like Erika and it’s good that YMCA caters for this age group ,” says Terry. So what do the next few years hold for a competitive and driven tennis player like Erika, who describes herself as a perfectionist on the court. “The ranking system changes week by week and Erika is currently ranked 69th for under 16s for her age, although she has been as high as 46th. As for ratings, Erika’s rating is 3.2 which is really good – Andy Murray is rated as 1.1!” says Terry. Terry is very grateful for the sponsorship from fashion sportswear company Laain and sports equipment company Wilson that makes it financially easier. “It’s great to have that support, especially from Laain who have taken a keen interest. Erika loves the sportswear they send her,” says Terry. Despite everything, Erika is a teenager who has good days and bad days and loves nothing more than to hang out with friends at the weekend. Her favourite ways to relax are watching Netflix, baking or song writing. We wish this inspirational young woman all the very best in her tennis career as she forges ahead in her dream to become the world’s number one. “I’ve been playing tennis here for nearly 10 years. When I was 9, I really wanted to become a professional. I started training around five times a week, but I was unable to keep up with the training; it would have meant playing around three hours a day. I was a bit disappointed in myself to reach that decision, and I was scared that Nick, my coach, would be disappointed too. But I think it all worked out well in the end – I do a bit of coaching now, I really like it, I find it rewarding. “I’ve been playing tennis here for about 12 years. I was in the first ever squad here, and have been in every one since. I really liked the Matchplays that Nick runs every weekend, and I was number one in 2008. We play team tennis against other clubs too. Last September myself and Moritz won Surrey under 16s which was really good, we played very well. When I was 11, I quite liked the idea of becoming a professional, but I got into Hampton School and realised it was a pretty tricky road to go down. I have never had a problem with the commitment, I just had a lot of other stuff going on. Out of all the tournaments I’ve played, the Surrey Under-16s was the best when Mortiz and I played doubles. We just clicked and played really well; we didn’t lose a match. “I’m very proud of these boys, as they’ve trained with me at YMCA Hawker from the beginning, and it’s been a real pleasure to see them develop not just as tennis players, but young people too. Moritz trained very hard for a few years when he was aged 9-11, his willingness to put the hard work in was always highly impressive. Although he plays and trains far less now, the work we put in during those years has given him an excellent technical base, which he is now growing into as he gets bigger and taller. “Harry has always had a fire burning inside that drives him to give his best in matches – it’s impressive to see him using this to subdue opponents. He has some excellent skills, and considering he has never put in an intense training period like Moritz, his playing level is excellent. It’s always a joy watching both boys play tennis, and hopefully they will continue to team up for many years to come. “Moritz has helped me out with a number of courses, including the LTA’s ‘Tennis4Kids’ campaign, which funds 10,000 kids to try tennis for the first time and get a free racket if they last the course. Generally, we don’t require a huge amount of help, but the older kids will happily step up if I need them to help coach, or to help run a competition, or do some umpiring. Moritz is doing his Tennis Leader qualification, which is for U16’s who want to take their first steps towards being a coach/hitter, whilst Harry completed his Level 1 Coaching certificate last summer. “Here at YMCA Hawker, we will have five teams competing in Team Tennis, which is the biggest annual team competition in the UK. They will compete against other clubs between April and June. We have our annual Summer Tournament on the middle Sunday of Wimbledon, which is always a very popular event. We have a mini-tennis tournament for all ages in May, something we tried last year with a family aspect in mind, and this proved to be a lot of fun, allowing parents and children to team up as doubles pairs.